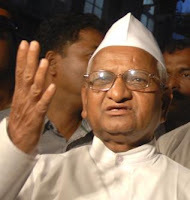 Anna Hazare whose fast entered sixth day has warned the government to release the LokPal bill as soon as August 30. He said if the government is not serious to curb the corruption fromt he society then an unprecedented revolution will rise in the country by the people of India who would leave only if the bill is passed or the government is down. Addressing the gathering of thousands of supporters in the capital, he said that the government has been cheating for past 20 years. Calling his struggle as the second struggle for independence, he encouraged the gathering to keep the flame alive even if there is no Anna in this world in the future. “They constituted a joint committee after my fast in April. But nothing came out of that meeting despite talking for two months. They betrayed the civil society…. The government’s intention to fight corruption is not noble,” he said. “The government says if the Prime Minister is investigated for corruption charges, the government will be shaken. But if the Prime Minister is corrupt and no investigation is done, this will be a great danger to the country’s security,” he further added. The innocence and the pure emotions of Anna has won the heart of many Indians. This is one of the biggest post independence protest in India which involves supporter from both Urban and Rural areas of India raising the same voice. The protest till now has been so uniting that Delhi police claims a 35% decline in the crime rate since the day Anna has declared fast.